Creativity in kids requires care and nurture. Although it is inherent with a child’s curiosity and penchant for discovery, creativity needs to develop early in order for the kids to bring it out. There are toys that can help encourage kids to bring out their ability to create from their active imaginations. This Magnetic Creation Station is one example. The Magnetic Creation Station is a tangram puzzle set that allows kids to create art out of the different multi-colored shapes available. Each colorful shape is magnetic and sticks to the included casing that doubles as a creation board. There are 46 pieces that come in different shapes, colors and sizes. 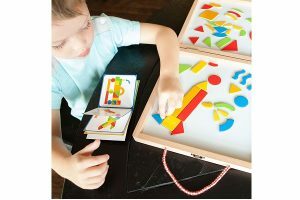 The set is accompanied by a colorful illustrated idea booklet that will guide the kids to do and recreate 20vibrabt scenes using the different magnetic pieces. They can also try using their creativity to make original scenes and images as well. The Magnetic Creation Station is an ideal toy set for kids with artistic inclinations. It can be a mess-free way for them to develop their artistic side and in exploring their creativity. It also helps the kids develop their fine motor and visual-spatial skills. Playing with the different shapes introduces them to shape learning and identification. The Magnetic Creation Station is ideal for kids from 3 years old and above. It is available at Fat Brain Toys for $25.